If you’ve followed my posts here on TMG for any length of time you know that I gardened for years with nothing but straw and leaves to sustain my garden. I was very successful. Nature is very user friendly and you can have great success with practically nothing — but there is certainly nothing wrong with doing things that will take your garden to an even greater level of sustainability (and success) and that’s what I’m going to talk about in this post. Cover crops have been around for long years before any of us were on this earth. Thomas Jefferson and George Washington sang the praises of buckwheat as a cover crop long before any modern scientific study was done. By the time I started gardening at the age of 35 — some 35 years ago —- I don’t remember reading all that much about them — which is just as well because I couldn’t have afforded the seed anyway. A lot of studies have been done over the past decade. And now —- as with many “old” practices —- it’s been “discovered” that the benefits from cover crops are numerous. They not only add nutrients, hold nutrients, protect the soil, hold moisture, act as a source of nitrogen, increase the diversity of soil organisms and break up ground — but they can be used as biomass (organic material) for your compost pile, mulch for your beds which also acts as slow compost, and sometimes serve as food in the form of grain— like wheat, rye, oats, and buckwheat. Or if your don’t choose to eat it — it can continue to sustain your garden by providing next years cover crops. I do a lot of things that fall into the Sustainable Gardening realm. I never have needed additional fertilizer. Compost — whether in the form of leaves raked onto the bed, straw used as mulch, cover crops, or “made” compost —- does the job of replenishing my soil. My soil is never bare. Covering the soil conserves nutrients and water. I don’t water, but try to conserve the water in the ground. I also have two rain barrels. A few years back I started saving my seed — although I still buy seed too. My goal with seed saving is to always have enough of my own seed that I can plant what we need to sustain us in any given year. And to have diversity in each crop. (More than one variety.) This will allow me to be independent if the situation calls for it. In my flower borders as well as my garden, I try to grow things that do well in my climate and area. This makes for easier care and low maintenance. I grow my plants from seed. Keeps me independent. I don’t have to rely on someone else unless I want to. I practice organic pest and weed control — mainly by hand or with the help of beneficial insects. Very little to purchase from someone else. Although I’ve been an organic gardener since the beginning, I’ve not yet totally reached sustainable gardening. As you can see from my list, I’ve made some good steps in that direction. As organic gardeners we are much better served — if we can plan to have our gardens sustain themselves without dependence on any outside sources. If you’re like me —and are not there yet — we can achieve the goal with planning and time. After more than 30 years of buying my straw from the same family of farmers, I’ve seen the danger of having become dependent on them. I can’t garden without mulch and lots of it. Like anything that is fairly new it’s taking some planning and time to work out the problems that might arise to block the way of my growing exactly as much as I want to as quickly as I want to. It’s not possible at this point for me to reach that goal in one year or even several, but I’m taking steps in that direction. This strip of winter rye on the outside of my garden fence was an idea I thought of in order to have room to grow more biomass in the form of winter rye. The strip is 40 long and about 1 1/2 feet wide. In the spring it will grow pretty tall — maybe 3 to 4 feet. I’ll let it seed; save the seed to use next fall. Then the biomass will be cut for mulch. 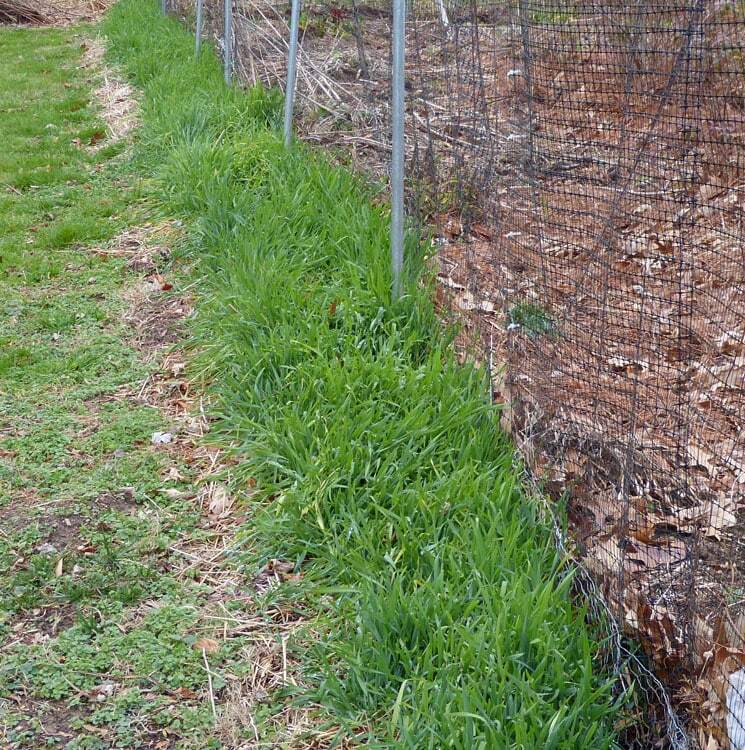 The dense roots that remain may help weeds from collecting near the fence. I’ll plant a different cover crop next fall for diversity. The soil is really nice here anyway — and will be even better when the roots from the rye decay. I could even plant a fall crop in some of the space next year. Maybe hakurei turnips, mizuna, lettuce or radishes. I’m even thinking tomatoes in 2014. This view gives you a better idea of the width of the strip of winter rye. It’s about 1 1/2 feet or more. As time passes I see more and more the need for us to become as independent as we possibly can. If we can plan our gardens so that they’ll sustain themselves without the need for outside resources — we’ll be in a good position. In addition to being a great plan to work on, we’ll see immediate results in making our gardens healthier and having them produce even bigger yields. I hope you’ll join me in working towards sustainable gardening so that we can continue to produce healthy food even in trying times. Great article Theresa, I have never used cover crops and you make it sound definitely worth the effort. We purchase a couple bales of straw each year for the chickens and then when the chicken pen is cleaned out it gets piled for a year and then goes into the garden. We have an abundance of chicken straw always ready for use. We do have to water here (high and dry desert climate) so I am wondering about the cost and extra work involved in cover crops. Our established raised beds require no deep digging and our soil is very rocky. Hmmmmmmmmmmm…..my brain is working. Wonder what hubby will think of digging around the fence line and planting a grain crop. Your comment really made me smile Alice! I have a feeling that —like me—- you’ll come up with all kinds of wonderful ideas with cover crops that will make your garden even better! 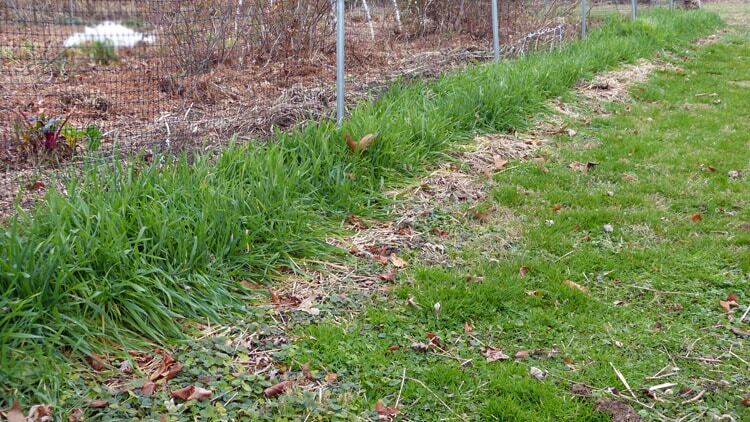 How do you deal w/ your cover crops in the spring when you want to plant seeds? A lot of people till their cover crops in; grind them up,as I understand it. But (like you, I believe) I have raised beds that I don’t till. Don’t the cover crops get in the way when you go to plant seeds? Regarding raised beds: I don’t have “framed” raised beds. They are naturally raised from the continuing addition of organic matter with no frames. But — like you — I don’t till. No need to. What you plan to plant and when you plan to plant it will determine what cover crops you plant. I planted buckwheat in a lot of the beds last year. I cut it when it blossomed and left it on the bed. Covered it with straw. Has long since decayed. Early spring crops like peas and onions will go in those beds. I’ll just pull back the straw and plant. Oats will winter kill. More than likely the roots of the oats will be well rotted by the time I plant things in April. I’ll check about 3 weeks before planting to make sure. If not totally rotted I’ll use a digging tool to toss it about a bit. Have some Winter rye in beds that are designed for warmed weather crops like tomatoes, squash and cukes —- I’ll let the biomass grow. When pollen is heavy on it — about May — I’ll cut the biomass and use for mulch on the same bed. I’ll leave the roots to decay — which will take most of the summer. In the meantime — they’ll help act as mulch for the veggie plants. In order to plant my tomatoes, etc. I’ll just cut a good sized circle out of the rye so I can plant. Field peas — which will grow quickly in early spring — can easily be pulled, cut and incorporated into the soil by hand or left on top. Do a search in the search box on the top left hand side —- for cover crops. The first six posts that come up will give you a lot more information. Good idea Theresa to use that strip. I like the idea of using every area of your garden to be useful. You would have your work cut out for you to produce biomass on the same scale as those round bales, but anything that makes buying in less of a necessity is good thinking. Yes — you’re right Sandra. It almost seems impossible for me to produce that amount of biomass — but nonetheless — I’m walking in that direction. I’ll get as far as I can! Thnx Theresa. I may try some of those. I was curious as to how large your garden was? I have never been very successful in gardening, but after stumbling upon your site by accident, I have decided to try again and (hopefully?) make it work. I cannot work a very large as I used to be able to, but maybe one about 50 ft.x 30 ft. is what I am aiming for. Laura — if you continuously add organic matter to your garden — and mulch —- it will be hard to fail. I think starting over with a smaller garden is a great idea. Although I don’t think 50 x 30 is particularly small. But I guess that depends on what you are comparing it with. My garden is about 60 x 40. Maybe a tad bigger. I have flower borders and a few island bed all over the little-over one acre that we have. When I run short of room in the garden I do plant some things in my borders. You can grow LOTS and LOTS of food in a 50 x 30 foot area. Perhaps — you may even want to consider starting smaller until you know you can handle it. When we first moved to our current residence — we started with a quarter of the size garden we have now — it was about 20 x 30. Then we added another quarter each year until we reached the size it is now — approximately 40 x 60. We were extremely busy during those 4 years and I could not have handled it — not to mention preparing it — if we had started with the full size. Search TMG for lots more how-to information and let me know how you do. If you have more questions feel free to ask. Also — are you in Virginia??? Glad you’re going to give gardening another go! Thank you so much for your quick reply. I am in Mississippi. I am just so encouraged by all that I am reading from you. I can’t make myself leave your site! What a wonderful comment Laura! I think “marketing” to sell products has made gardening seem complicated and undoable for lots of folks. Actually — you don’t really need anything by desire, effort, organic matter and mulch to be successful. It’s all pretty easy —- so I am thrilled that you are encouraged. Keep me posted. I’ll be anxious to hear your thoughts as you progress. Do you grow most of what you eat? I’m sorry if that sounds like a crazy question! Not a crazy question at all, Laura. We eat mostly from our garden. In the growing season it is indeed a feast! Of course I fall short. I buy organic Olive Oil, Vinegars, my flour for my bread, eggs,and whole wheat pastas. Brocolli, carrots, potatoes and cabbage in the winter. I only have potatoes from the garden 7 to 8 months out of the year. Even though I buy organic potatoes I can’t hardly stand the taste of store-boughts. Just not delicious like those from my garden. I plan my meals according to what I have in the garden. That’s a little different than how many folks do it. In other words — I don’t plan and then go to the store. I go to see what I have in the garden and then plan the meal. I used my last tomato today and will really start to feel the crunch of not having fresh veggies now. Although — I have many things in the freezer. All I have in the garden now is chard, mizuna, lettuce, a few hakurei turnips, a few small carrots, bok choy, and some parsley, thyme, and rosemary. I don’t know how in the world that you had a tomato at this time of year! We are much farther south, and we have never had any tomatoes past October. I need to know all of your secrets:-) I will try not to pester you too much, though. I just have WAY too many questions! So I put it in again there for you and answered you there are well. Hi. I’m new to your blog and really enjoying it. This post made me think of the book by Carol Deppe “The Resilient Gardener: Food Production and Self-Reliance in Uncertain Times”. It’s a great book. Anyway, I remember her passage about self-reliance stuck with me. She feels the goal should be “interdependence” not independence. That human beings have traded with each other since the beginning of time and will continue to do so. In bad times, your most critical need will be a skill or product that is worth trading (such as vegetables!). Now, I’m not saying it wouldn’t be great to grow your own mulch… just wanted to contribute some food for thought. Maybe working together with other local farmers is not such a bad thing. Welcome to TMG, Jill. Your comment makes a good point. The only things that worries me is that most farmers I know are not organic and use chemicals and poisons without hesitation. I just had a 2nd generation farmer tell me the other day that 2-4D was not in least bit harmful. And yes — he was serious. He also told me last year that certainly Monsanto would not sue farmers if the wind was the cause of their gmo-2nd generation corn. Obviously he’s not keeping up. I think about the most wonderful thing in the world would be to trade my good quality organic stuff for another growers good quality organic stuff. That would definitely be a win-win situation! And a lot easier than my having to try to grow everything myself. Nice to have you reading! Thanks for your reply Theresa. Your concern about what is put on the straw is certainly warranted. I’m an editor and recently edited a book on composting. In my research I came across studies that show certain herbicides are not broken down by composting or even animal digestion! They pass from hay into the manure of animals and using the manure as fertilizer can have negative effects on food crops. Since straw is a “raw” product that has been neither digested or composted, it is even more vulnerable to contamination. One article about it: http://www.the-compost-gardener.com/picloram.html . I would definitely ask your local farmer about these particular herbicides. I appreciate your taking the time to post about this. I think it is so important for folks to realize what’s going on and the more they see — the easier it is for them to make the connections necessary to avoid the stuff. Thanks so much — again.